Viking Yachts lays claim to leading the industry in production luxury sportfishing yachts and refined express fishing boats. With an impressive history that spans over a half century, largely attributed to continual, hands-on R&D aboard their boats at events across the globe, it’s no surprise to also find a Viking leading the charge on the tournament trail as well. An event of note that Viking is proud to support is the Big Rock Blue Marlin Tournament – One of the largest blue marlin tournaments in the world. Each year, nearly 200 teams battle it out for release points and the thrill of bringing a massive blue marlin to the scales in Morehead City, NC for a shot at a multi-million dollar purse. A feat that escapes most teams and only a few can lay claim to each year. But as it turns out, A Viking yacht has been hitting the scales during The Big Rock on a yearly basis and placing on the leaderboard for the last three years. Most recently, the Viking 48 Rehab placed 2nd overall in The Big Rock with a 506.9-pound blue marlin. A year ago in 2016, the Viking 72 demo boat landed 3rd place in the tournament weighing a 564.1 pound blue marlin. The Viking 72 team also took first place honors in the NC Governor’s Cup with an astonishing 3,214 points across multiple tournaments fished by the professional Viking crew. 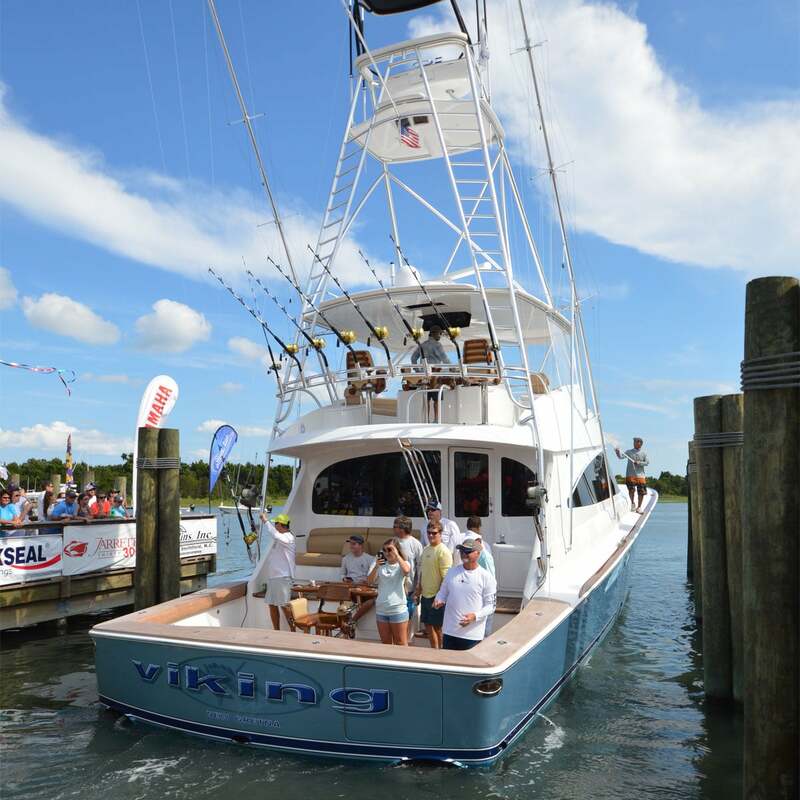 And kicking off this trifecta, the 57th Annual Big Rock Blue Marlin Tournament in 2015 witnessed the all-new Viking 62 demo boat, captained by Brian Komer, backing into Big Rock Landing with an impressive 680-pound blue marlin in the cockpit. This enormous fish was fought and boated by Bluewater Yacht Sales managing partner Earle Hall in the first hours of the first day of the tournament. The Viking/Bluewater team took first place in the tournament with a generous payout exceeding $560,000! It’s no secret – just check the leaderboards of tournaments up and down the Eastern Seaboard and around the world – Viking Yachts rock the tournament trails just as well as they lead the industry in producing sportfishing boats!